AND is super quick and easy to make, and is all done in a food processor. Sounds impossible right? Must taste a bit average? Nope. It’s very, very nice. A lovely firm, moist (sorry Miranda fans!) chocolate cake that is even better the following day. Most people eating this would have no idea that this is not a traditional cake, and it would also be a great option for a healthy and low allergy option at a fundraising cake stall too. When I saw the 84th and 3rd cake doing the rounds on Maryana Lishman’s fabulous Real Food In New Zealand Facebook Group I wasn’t convinced, but after seeing yet another member raving about it I gave it a go (*ahem* asked my mum to please make it for my birthday). Yum. I’ve now made this myself three times and adapted it to my lazy ways – yes, I am a lazy baker who doesn’t have the patience for things like creaming butter, seperating eggs and sifting all the dry ingredients! If you want to check out the original recipe you can find it here – I haven’t tried the crazy cauliflower icing yet but plan to give it a go at some point! Anyhow – here’s my recipe. Put raw veggies in food processor. Process until it is very very small. Add eggs, sweetener, melted butter or oil, vanilla. Whizz until combined. Add the dry ingredients. Whizz until combined. This will be a very thick mixture. Taste. Add extra sweetener if doesn’t seem sweet enough for you. Vegetables: My favourite is carrot and kumara together – pumpkin on its own you could still taste it a bit. I haven’t tried zucchini but would suggest whizzing on its own and giving it a squeeze to take some of the water out. I probably wouldn’t do beetroot just on its own either. Egg-free: grind 2 Tablespoons chia seeds in a food processor or coffee grinder until a fine powder. Add ½ cup of water and leave until a thick paste, and add to wet ingredients. This version is more delicate than the egg version, so you need to leave it in the tin to cool completely. Sweetener: Could also try honey, or for a sugar free option mixing ¼ cup of Natvia or Norbu with 1/4 cup water. Or try coconut sugar with ¼ of water. I have successfully done a combination of ¼ c rice malt syrup, 2 tablespoons of Norbu and ¼ cup of water. Always taste before putting in the tin and add extra sweetner if needed. Butter/oil: Apparently you can make this with olive oil, but I haven’t tried it. I’ve also not melted the coconut oil and it turned out fine. The cake may seem oily to start with but this absorbs in as it cools. If you want to do a layer cake, double the recipe and bake in two tins (doesn’t cut into layers well apparently). 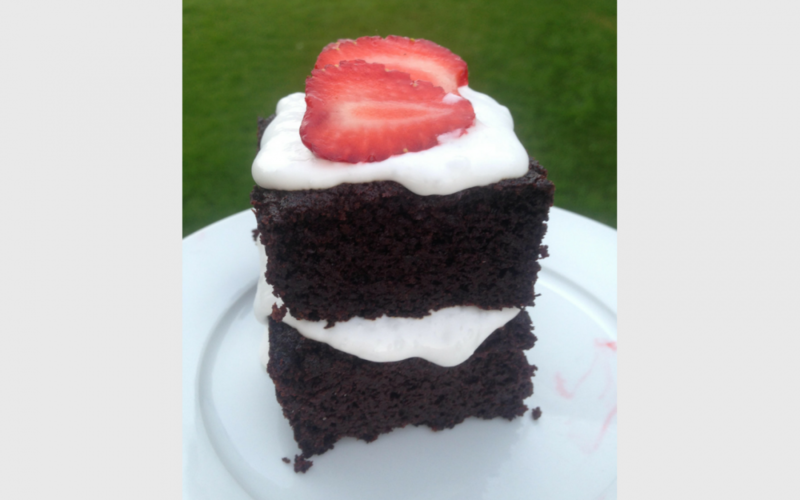 Or for lazy cooks like me, just do a normal recipe, cut cake in half and stack to make a semi-circle layer cake. I’ve also made in muffin tins and bake for around 15-20 minutes – they don’t really rise so fill to the top of your pans, and they come out totally flat topped so icing is needed to pretty them up! 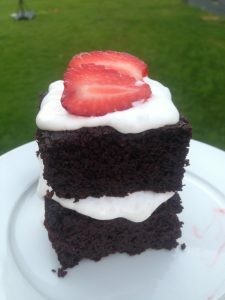 For icing, I used my lazy whipped coconut cream icing – chill one can of coconut cream in the fridge for 24 hours (I use Homebrand as it’s cheap and has no additives). Turn upside down before opening and then pour off the liquid. Put a stick mixer straight into the can and whizz until cream becomes lovely and smooth and thick like whipped cream. Add sweetener (I use stevia drops, but can use rice malt, maple syrup etc) to taste. I’ve also added Fresh As strawberry powder before for a pink icing. Plonk on cake. Done. Note: the cake will turn this icing brown overnight, so ice right before eating. If you’re not used to coconut cream, this could be a bit coconutty for you, so try adding cocoa and extra sweetener if it’s not to your taste. I’ve seen another easy peasy dairy free recipe that I want to try- melt a block of Whittakers 75% Dark Cacao chocolate or other dairy free, high cacao solids chocolate, then mix with one can coconut cream to make a ganache. Higher in sugar but sounds pretty yum for a special treat. Want more awesome recipes? In every Real Good Fundraising newsletter I share at least one recipe, you can sign up by clicking here. Or follow us on Facebook too!